This is a project to match food growers without gardens, with those who have space but need help maintaining it because of age or disability, or who would simply like to share their garden to learn more about growing food. We hope to help address the lack of allotments in the area and maximise the potential of existing gardens. We have developed a model contract and will oversee the process to make sure both owner and grower are happy with the agreement. We have publicised the project with the help of the Neighbourhood Care scheme at HNCC and an article in Camden New Journal, and have already received several offers of space. 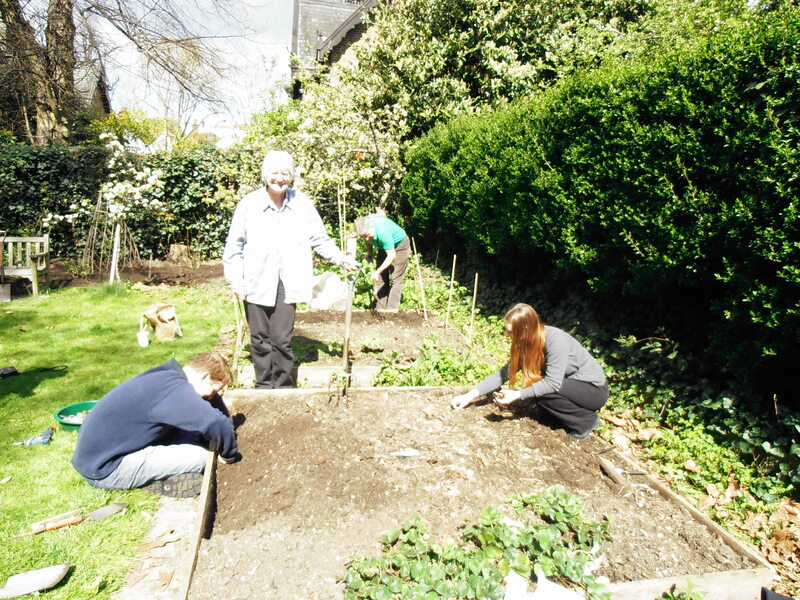 We matched our first garden sharers in March and our second in April – read their stories below. So if you’ve been languishing on an allotment waiting list for years and would like to share a garden, possibly in return for helping a garden owner to maintain their space or learn to grow food, please email us to set up an initial meeting. Sean and Sally, Dartmouth Park residents, were feeling rather overwhelmed by their large garden and were attracted by the Transition idea of garden sharing as a more sociable way of gardening. They wanted the bits of the garden that had run wild to be cleared and used to grow fruit and vegetables in a nature-friendly way. So they have teamed up with two local couples to share their garden. Garden sharing can take different forms and they have different arrangements with their two sharing partners. Michael and Sarah (M )live in a second floor flat on Holly Lodge, which is a bit restrictive in terms of space for food growing, so feel that being able to share some garden space is a real opportunity for them. They describe themselves as absolute beginners and keen to learn some gardening skills, so are finding it really helpful to have some guidance from more experienced gardeners! They share one of the raised beds and a herb garden with Sally and Sean, which they’re currently weeding and preparing for planting. They’re hoping to grow courgettes, broad beans, runner beans, peas and strawberries. They’re also looking into the possibility of growing some tomatoes in grow-bags on the patio. They’ve agreed to split costs and resulting produce 50/50, but they’re mainly looking forward to proving to themselves that they can do it and to helping Sean and Sally with their garden. David and Sarah’s house, round the corner from Sean and Sally, has a small back garden in which they have been growing some vegetables and fruit for the last three years. They were keen to be able to extend what they grew but had no more space in their garden. They have taken responsibility for clearing and planting the overgrown end of the garden, and this year they have cleared enough space to plant four fruit bushes. They hope to be able to clear enough of this area during this summer to be able to do further planting in the autumn. They have also taken responsibility for the second raised bed which they have weeded and planted with rhubarb, beetroot and potatoes. For them, having languished on the council allotment list for many years, it is a dream come true to be able to share Sean and Sally’s garden and to be able extend their food growing. The costs and the produce will be shared, though the fruit bushes are a long term project and won’t produce much for a few years. We met by chance at the first Transition Dartmouth Park social evening at Forks. We happened to sit next to each other and find out that Jane was interested in doing some gardening and having an outside space to relax in, and that Tammy had a communal garden which she used to maintain but, due to M.E, has no longer been able to. We both live near Archway. So far we have mainly been tackling the terrible ground elder which has been free to run riot. It is accompanied by wild garlic, which is far more palatable than the ground elder. Despite the “edible but an acquired taste” listing in “Food for Free”, we cannot recommend it! The wild garlic, although attractive and tasty, has also run riot. We have resorted to a neighbour’s discarded carpet underlay in an attempt to cover and tame it. Regarding planting, we have together visited some Open Gardens in the area and bought attractive plants which are doing well in the spaces cleared of elder, garlic and box hedge. For edible plants, we are interested in trying Stevia (a natural sweetener). Fortunately Tammy is a bird enthusiast and happy to keep “Robin Watch” whilst Jane (who is not) digs. We have found quite a lot of shared past experiences and interests so we are grateful to Transition for the introduction. Tammy and Jane, June 2012. This is such a lovely idea and benefits all involved. I’m so pleased to see that it’s working out.